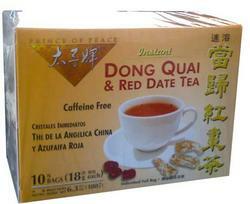 This product brings you all the natual benefits of Dong Quai and Red Date in our special proprietary blend of instant Dong Quai and Red Date Tea. Each bag contains concentrated extract of Dong Quai and red Date which are believed to better support female body functions. Dong Quai, also known as Angelica or Dang Quai, has been a highly treasured herb in the Orient for thousands of years. It is offen referred to as "Female Ginseng". Red Date is neutrtal and warm in nature with a sweet taste. This delicious and nutritious tea is ideal for home and travel. Each tea bag is extracted from 30 gram of raw DOng Quai and Red Date. Brewing Instruction: Per pack, add 6-8 oz. of hot or cold water and stir. Vary water levels to preferred taste.